It’s a common claim among gun advocates that firearm ownership makes people safer. Research into gun violence, however, points in the opposite direction. 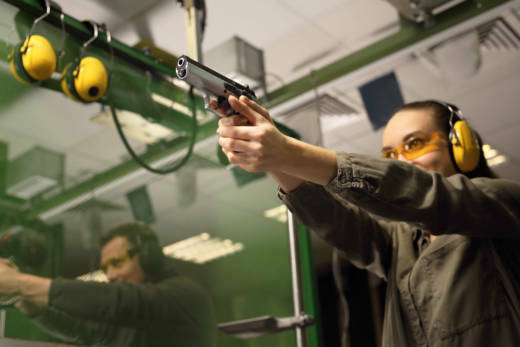 Science writer Melinda Wenner Moyer recently examined the evidence surrounding gun ownership and safety for the October issue of "Scientific American" and spoke about her findings with KQED. KQED: There's this very common belief that people are safer if they own a gun or if they have a gun in their home, and you dug into the evidence. Tell us what did you find? Keeping a gun in your home makes you more likely to be a victim of crime, homicide or suicide. Melinda Wenner Moyer: There's a lot of different ways to look at this question, which is kind of a central claim made by the gun lobby that more guns in the hands of good guys will keep you safer. But when you look at the question from a lot of different ways, it kind of all comes out the same: which is that, no, owning a gun, keeping a gun in your home, carrying a gun, none of those seemed to make you safer. KQED: How strong is this research? It seems like studies that are about gun violence come in for a lot of scrutiny, especially when people don't like the outcome. Moyer: Actually there hasn't been as much research as we would like. That's in part due to the NRA [National Rifle Association] and the gun lobby. There was a lot political pressure put on Congress by the NRA to tighten the rein on the CDC [Centers For Disease Control and Prevention], which funds a lot of gun research. And in the '90s, they actually passed a rider in the CDC's funding bill that said that the CDC can't fund any research that promotes gun control. And the CDC basically interpreted that as if we're do more gun research, we might get defunded. They've been really scared and they haven't been funding really any gun research. As a result of that, there isn't as much research as we would like, but there's still been a lot. And some gun researchers actually have been using their own money to fund studies, because this is a hugely important question. The studies have been done in a lot of different ways to try to really get at the truth. And largely — there's been more than 30 studies — they pretty much all point in the same direction. There's a few outliers, a few studies that don't confirm this, but when you take all of the research together, there is enough to really make a clear conclusion here. KQED: Talk about some of those conclusions. Moyer: There's been research showing that if you keep a gun in your home, that doesn't actually reduce your risk of gun violence. It actually makes you more likely to be a victim of crime or homicide or suicide. There's also been research looking at concealed carry rates. As those have gone up in some states, have there been drops in crime and in violence? And they found largely, no. There's been some research by some controversial researchers that points to possibly, yes. But it's really largely been refuted in recent years. And then there's really the central question of, if guns are protective then that implies that Americans are using the guns for self defense all the time. And the research there also suggests that actually guns are used for self defense in less than 1 percent of all crimes that occur in the presence of a victim. People aren't really getting the chance to use their guns for protection anyway. KQED: Gun ownership doesn't make us more safe. Does it make us less safe? Moyer: Yes. That is what the research largely suggests. It makes us less safe. KQED: What accounts for that? Is that because if there's a gun around, then I'm more likely use it to hurt myself or hurt another person? Moyer: Well, certainly the suicide becomes much more likely and much more, unfortunately, sort of successful when you own a gun. But really scientists are trying to figure out exactly why this is. It could be that when you own a gun you might take a few more risks, you might go to places you might not otherwise go without your gun. You might sort of end up putting yourself in riskier situations that put you ironically more at risk for crime and violence. There could be a lot of different reasons here, and it's really hard to tease out and that's one of the reasons we need more or better research to really understand what's going on. KQED: In the piece you wrote, you talk about firing a gun. Can you describe that feeling? Moyer: Yes. It was the first time I've ever fired a gun, and it was terrifying at first. And then, after I shot this zombie target, I just felt this really strong sense of exhilaration and confidence. Like, 'Wow, I can't believe I just shot a hole right next to this zombie's eye.' And in that moment, I kind of understood this belief that guns keep you safer. You're holding this incredibly powerful tool. It makes sense that it would make you feel like nobody can hurt you. But, unfortunately, it seems like that's not the case. KQED: You spoke to a lot of gun owners for this piece. What were some common threads? Moyer: There seems to be a really strong belief that, sort of a logic based belief, that well of course carrying a gun is going to keep you safer, because if you're going to find yourself in a scary situation you've got your gun. Or maybe somebody will see your gun and then not try anything, not try to make you a victim of crime. There's just this very pervasive deep belief that guns keep you safer. And it seemed as though data and science didn't really matter. Sometimes I would bring up, well, there are a lot of studies that actually suggest that guns don't keep you safer. And they would say, well, that just doesn't make sense. It's like the logic is more important to them than the data. Moyer: You also found some beliefs that were not as entrenched as the gun lobby suspected. Moyer: I think the NRA sends this message that everybody who has a gun is uniform and rejecting background checks or not wanting any gun control. And there's been actually a lot of surveys suggesting that people who own guns, people who are NRA members, don't have necessarily these extreme views. They're in support of a lot of gun legislation including background checks. It's just not as extreme as the NRA makes it out to be. KQED: What did you find most interesting in reporting this article? Moyer: I was surprised by how willing everyone was to talk to me knowing that I was investigating this question. I found people were really happy to open up and talk about how they felt about guns. And I was actually surprised that a lot of the opinions of people who I talked who were gun owners and who very sort of pro gun. They were a lot more measured than I expected. There weren't a lot of really extreme opinions. I talked to an owner of a gun shop. He said, 'Gosh, I think the NRA has gone too far. I don't think we should all be carrying guns.' This is a guy who makes his living selling guns.